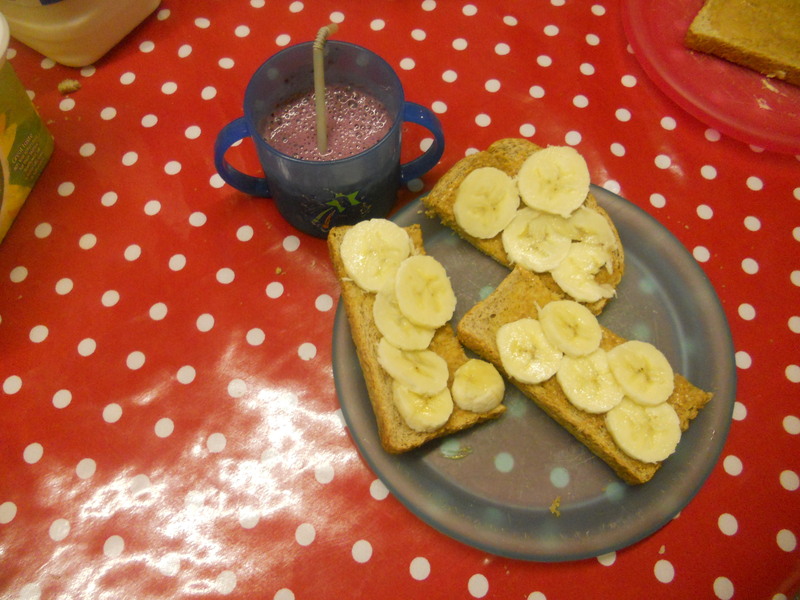 A day in the life……….highlights! – Making Memories in The Chaos. Good Afternoon everyone! (Saying that takes me right back to 3pm in school and a classroom full of pupils desperate for the bell to go and for me to say those magic words!!) I can’t believe it is Friday already! This week has just flown by! And I had great intentions of doing “A day in the life” post every day and here we are at the end of the week and I am only doing my second one! Kerry over at the Winding Road had set up this little bloggy fun and I feel bad that I have not fulfilled my commitments -apologies – life kinda got in the way! This avo I’m going to share with you some highlights from each of the days this week and hopefully that will help you build up a bit of a picture of our typical week. 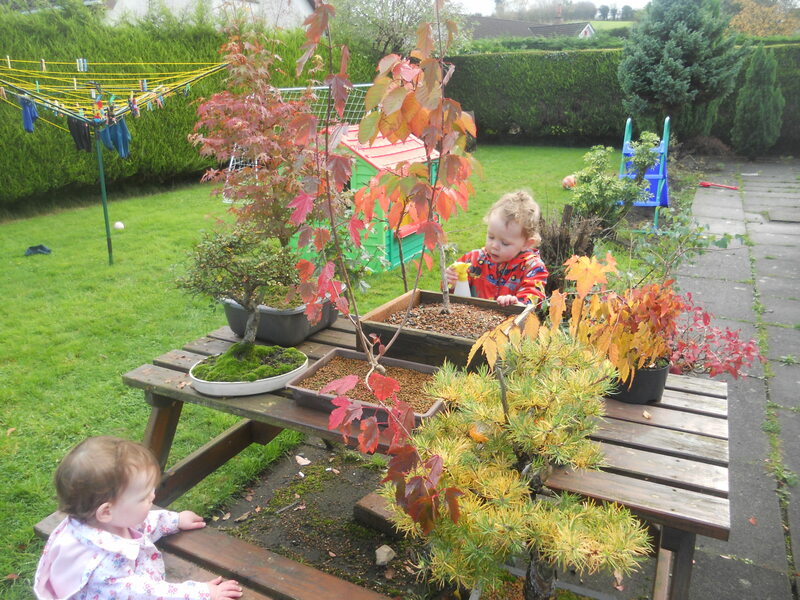 After leaving J up to playschool, S and L and I got stuck into some play. They LOVE water play – especially S my 2 year old – he’s forever sneaking into the bathroom at the minute and causing mayhem….so this morning I decided to channel it! 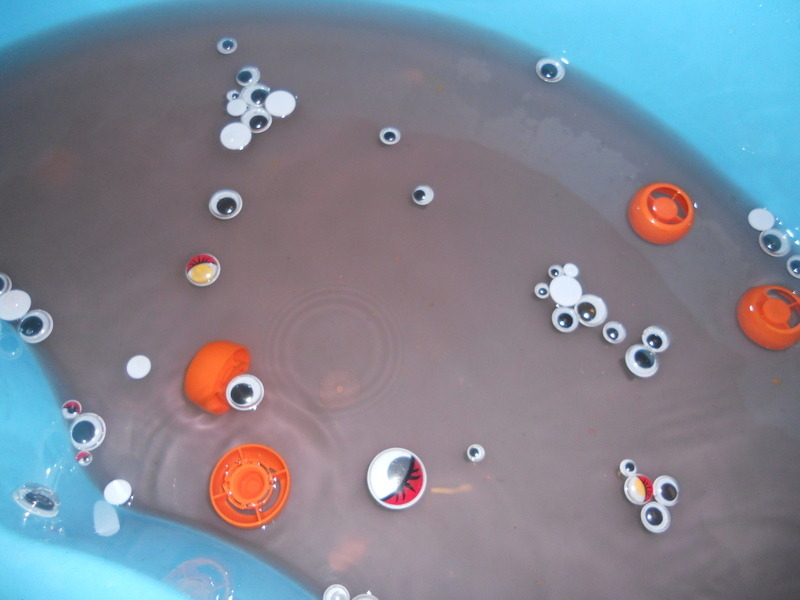 I set up a little water table activity – monster inspired – orange coloured water, with googly eyes and various spoons, jugs, cups etc to play with! It turned out that they played with this ALL day (on and off!!) J loved it too! 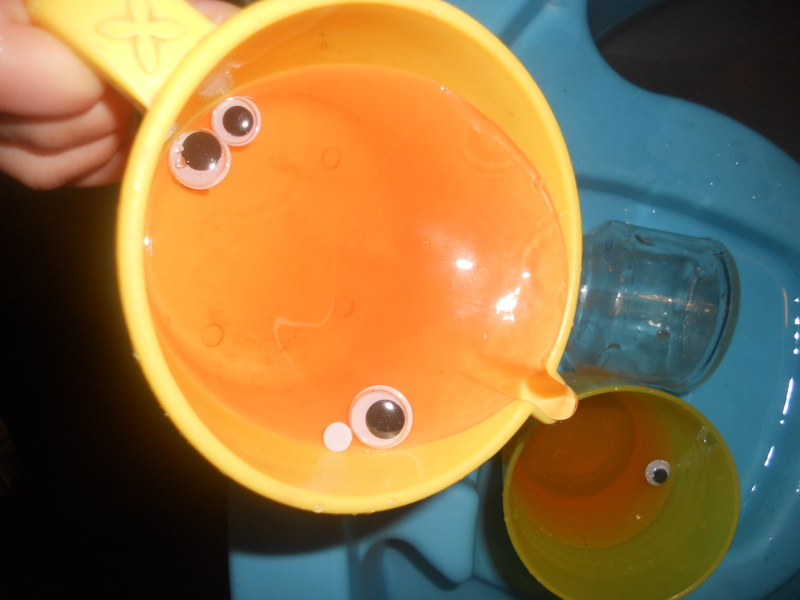 They had great fun and also practised some great skills too – vocabulary – full/empty/float/sink/almost/nearly, some mathematical skills there too, some fine motor skills and gross motor skills and some imaginary play – whoop! I played along with them in the morning, but then they just played independently with it throughout the day – hello lots of wet clothes!!!!!!! S decided to added in the tops/lids because they were also orange! 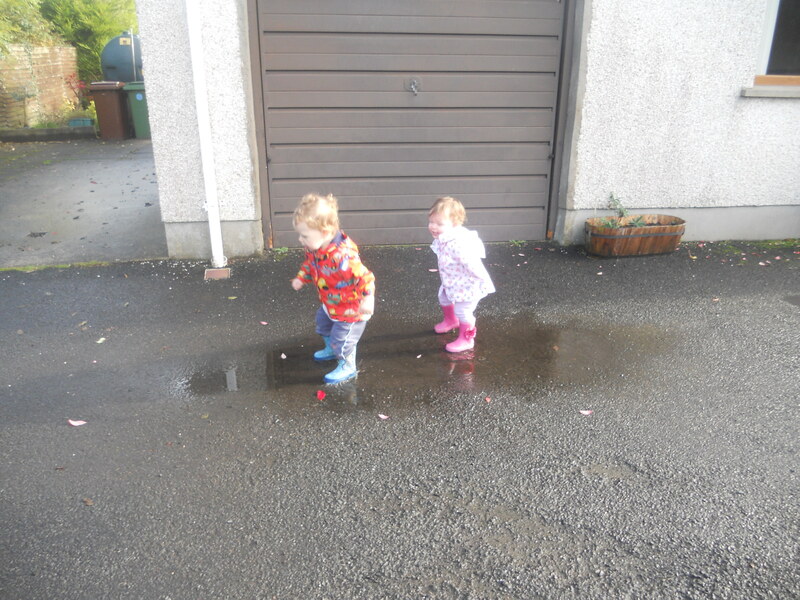 I like to get the kiddies outside every day as much as possible – Tuesday was a great day for splashing in puddles and spotting Autumn! 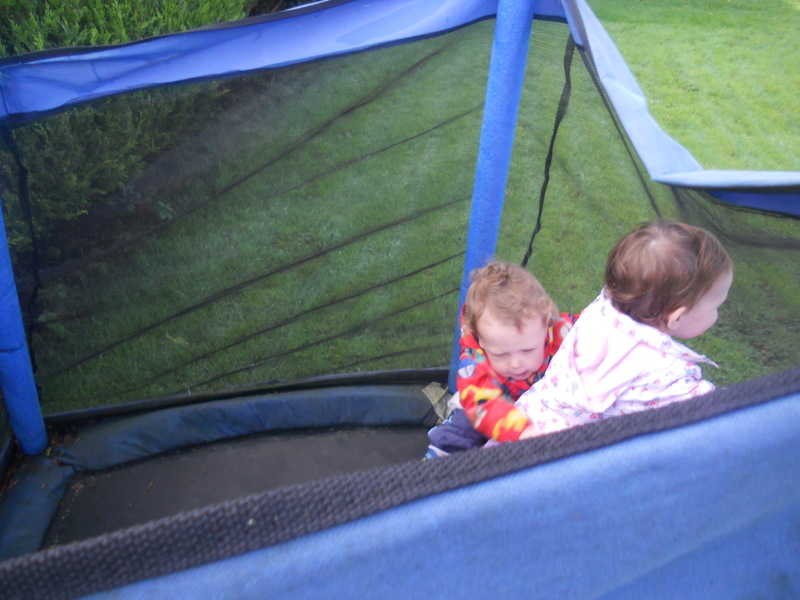 Home from pre school – all 3 played outside while I made lunch – chaos on the trampoline! And then it was nap time – aka time for me to catch up on housework! Wednesday is our day for seeing Granny (my mum) – her and I and the kids have done something almost every Wednesday since J was 2 weeks old – so I guess it is kinda tradition! It is the highlight of the kids week. This week, I took S and L to mums and tots in our church and then mum took me, J,S and L and my sister out for a birthday lunch! My birthday is 24th October and my little sisters is 25th October – so we had a double celebration! Wednesday evening I took a whopper of a migraine – so went to bed at 8pm and slept right though to 630am – oh yes indeedy!!!! And Thursday morning – I felt good!!!!!!!!!!!! Despite the fact I was turning 32 that day! THIRTY TWO?!?!?!?!?!?! HOW DID THAT HAPPEN????? I remember when I was 16/17 thinking someone at 32 was pretty old and mature – now that I’m there I don’t feel that old or that mature! Thursday – my birthday – so not really a typical kind of day! Again we normally don’t have the car on a Thursday so we normally organise a wee play date. This Thursday however, I just wanted to hang out with my babies at home. We made buns, watched Disney movies, danced, had a little mini birthday party that evening. I got spoilt rotten – breakfast in bed, lots of lovely pressies, Chinese, cake, and loads and loads of kisses and cuddles. The day was pretty perfect I have to say. 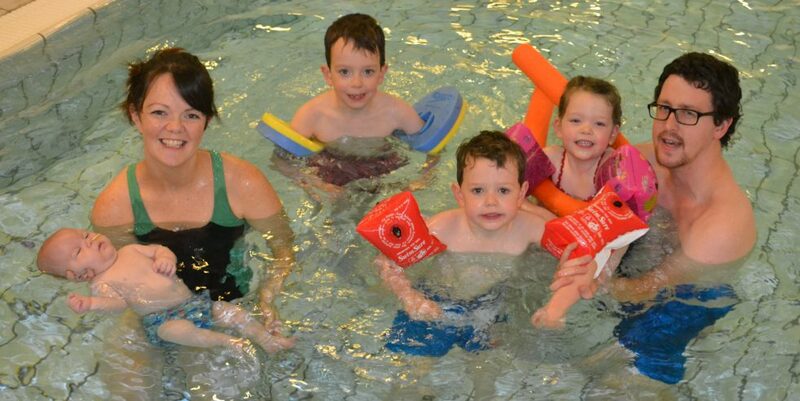 And bless their wee cotton socks – J must have told me a thousand times, “You’re beautiful mummy” and “I love you”, S didn’t throw a terrible two’s tantrum the whole day and L giggled and found me utterly hilarious the whole day! This morning we took Daddy to work…. I like to have a wee browse around Sprucefield on a Friday morning – there’s a new Next opened up with a fab coffee shop – if you live locally it is worth a wee visit! I treated myself to a wee cappuccino and muffin and L and S had some milk and cookies, but sssssssssssssh don’t tell J – he would be mad!! It was lovely. We did some people watching from the windows of the coffee shop and some “BUUUUUUUUUUUUUUUUUUUUUUUUUS”!!!!!! watching too! Super cute, right?? I can’t wait to make a little family of them! 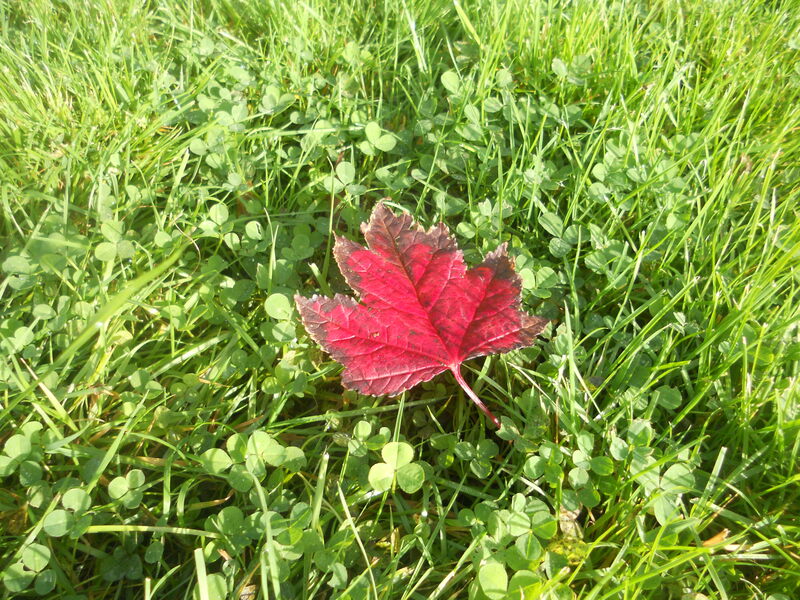 Gosh, this was a long post, if you’re still reading – fair play! Hope I haven’t put you off reading any further posts!!! 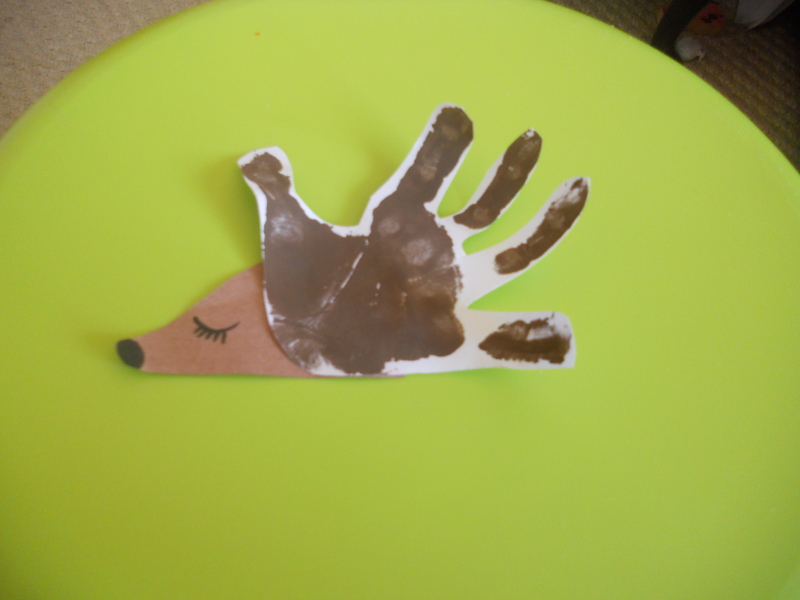 Off now to make up some brown paint and cut out some hedgehog faces! Previous Post A day in the life of…. Hee hee! They LOVED it! We had to have it out again today! You’re a great mama! 🙂 love all the crafts and learning activities. And Happy Birthday!!! My sister and I are a day apart too…i’m Aug 23, she’s the 24th.